Lulu Bravo is Professor of Pediatric Infectious and Tropical Diseases at the College of Medicine, University of the Philippines Manila. She is the former Vice Chancellor for Research and Executive Director of the National Institutes of Health, University of the Philippines Manila. She has served as World Health Organization (WHO) temporary adviser and member of the WHO Technical Steering Committee of the Child and Adolescent Health Department raising awareness on the Control of Diarrheal Disease program (CDD) since 1985, followed by the WHO Integrated Management of Childhood Illness (ICMI) in recent years. She has organized and conducted hundreds of training seminars for pre-service and in-service on the WHO Case management for Diarrheal Diseases as well as on the IMCI. She has conducted clinical trials on oral rehydration solution (ORS) in the 1990s and vaccine trials in the last 15 years, and has published more than 75 papers and abstracts, locally and internationally, on various infectious diseases topics. At present, she is President of the Immunization Partners in Asia Pacific (IPAP) and current Executive Director and immediate past President of the International Society of Tropical Pediatrics, past Chair of the Asian Strategic Alliance for Pneumococcal Disease Prevention (ASAP), and former president of the Asian Society for Pediatric Infectious Disease (ASPID).She has served in various capacities in many other Asian medical and professional societies as well as in Philippine health associations including the Philippine Foundation for Vaccination (PFV) of which she is the founding President. She is also a member of the Pneumococcal Awareness Council of Experts (PACE) and member of the TWG of the Dengue Vaccine Initiative (DVI). 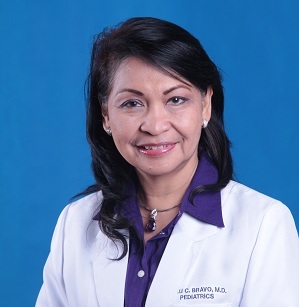 Her work has earned for her various honors and awards in the academic and research fields, including the Dr. Jose P. Rizal Memorial Award for Academe and the 2012 Asian Outstanding Pediatrician Award given by the Asia Pacific Pediatric Association. Dr. Lulu Bravo completed her MD, pediatric residency and subspecialty training in infectious disease at Philippine General Hospital-College of Medicine of the University of the Philippines Manila. She completed her fellowship in paediatric infectious disease at the University of Texas Southwestern Health Science Center in Dallas, USA in 1986.